We had this delicious salad as our meal last night. 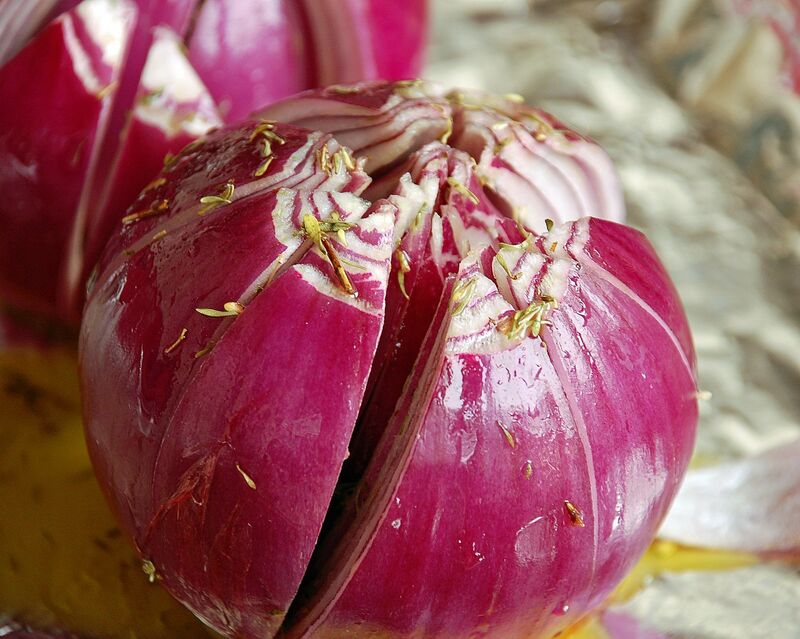 It was created out of a hankering for roasted red onions. The end result was outstanding. 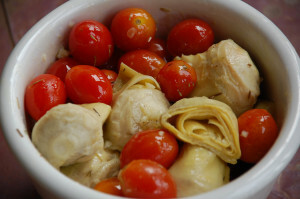 I added some cherry tomatoes and artichoke hearts to the roasting process, because…why not. Sliced chicken breast and goat cheese crumbles were thrown in as well to make the salad a full meal. Because one of our family members (think the 15-year boy) still hasn't discovered the joy of vegetables, I made some cornbread muffins with ham, cheese, and jalapeno as an accompaniment. I don't cater to the whims of each family member, but I often try to have something that I know will appeal to all. Peel and slice top off of onions. Shave root end carefully, making it as level as possible, but keeping end in tact. Slice almost all the way through the onion, cutting into eighths. Don't cut all the way through. Stop just before you reach the the root end. Place onions on aluminum foil lined, rimmed baking sheet. Stir your dressing so that the garlic and thyme aren't settled at bottom of container and drizzle with 1/2 of the dressing. You want to make sure you have some of the garlic/thyme on the onions. Toss remaining dressing in a bowl with tomatoes and artichoke hearts. Roast onions for 20 minutes. After 20 minutes, add tomatoes and artichoke hearts to pan and put back in oven for another 20 minutes. After vegetables have cooked, let them cool for 10-15 minutes. Place spinach in your bowl, top with chicken and cooked vegetables. Sprinkle with crumbled goat cheese. The oil and juices from the cooked vegetables provided all the additional dressing we needed on our salad. If you need more, whisk 1/4 cup olive oil with juice from 1/2 lemon and 2 TB sherry vinegar and serve it alongside the salad. Please know that I welcome each and every comment that comes my way. If you want to make sure you don’t miss future content, pop your email in the beige box up on the right or click<a href=”https://nourishandnestle.com/about-me-and-this-site/subscription-page/”> here</a>. I usually send out 2-3 emails a week, so I won’t inundate your inbox…believe me, I’m sensitive to an overflowing email inbox! You can access many of the products I refer to in all of my posts on my Nourish and Nestle Amazon Page. You can access it <a href=”https://www.amazon.com/shop/nourishandnestle” target=”_blank” rel=”nofollow noopener”>here</a>. So, if you’d like to get in on the ‘subscriber benefit’ action, <a href=”https://www.nourishandnestle.com/about-me-and-this-site/subscription-page/”>simply subscribe to Nourish and Nestle here</a> or using the form on the right sidebar. It’s towards the top a bit. I have sent all my subscribers the link to the Subscriber Benefits Library. If you missed it or misplaced it, drop me a line.